SpaceX has launched its Falcon 9 rocket early on Monday, carrying the CRS-9 Dragon spacecraft bound for the International Space Station (ISS) with a cargo of supplies for the outpost and a docking adaptor for future manned missions. 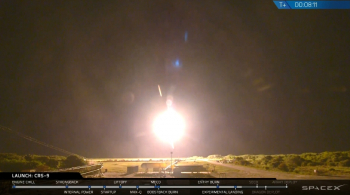 Liftoff from Cape Canaveral occurred at 00:44 local time (04:44 UTC), with a successful landing at LZ-1 for the first stage. Monday’s launch – the tenth Dragon mission to launch for the Space Station – is being flown as part of NASA’s Commercial Resupply Services contract with SpaceX. 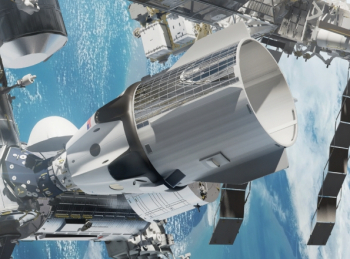 It follows on from the successful CRS-8 mission earlier this year, which also delivered the Bigelow Expandable Activity Module (BEAM) to the station. 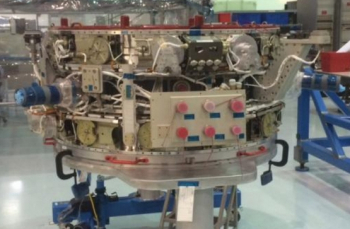 Along with pressurised cargo, CRS-9 is carrying an International Docking Adapter (IDA), which will be used to convert a former Space Shuttle docking port for use by future US manned vehicles. The launch also involved the latest attempt to recover the Falcon 9’s first stage, which was the second LZ-1 landing success for SpaceX. In contrast to recent launches which have landed – or at least attempted landing – atop the Autonomous Spaceport Drone Ship (ASDS) at sea, Monday’s mission aimed for dry land at SpaceX’s Landing Zone 1 – the former Launch Complex 13 at Cape Canaveral. Developed under NASA’s Commercial Orbital Transportation Services (COTS) program, Dragon is one of two commercial vehicles which share US supply missions to the International Space Station, along with Orbital ATK’s Cygnus. Dragon first flew in December 2010, before making its first visit to the space station on its next mission in May 2012. These two missions completed SpaceX’s commitments under COTS, allowing the spacecraft to be used for a series of Commercial Resupply Services (CRS) missions under a contract for twelve initial missions awarded in 2008. Although Monday’s CRS-9 mission was the tenth Dragon to launch bound for the ISS, this number includes last June’s CRS-7 flight which failed to reach the space station. 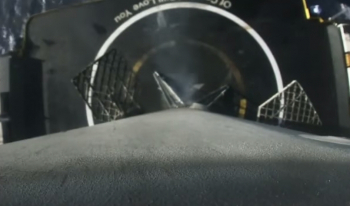 During that launch, a helium tank broke loose within the Falcon 9’s second stage, causing the tanks to become overpressurized and the vehicle to undergo what was termed a “rapid unscheduled disassembly”. This remains the Falcon 9’s only launch failure to date, however the October 2012 launch of the CRS-1 Dragon resulted in a partial failure; a first stage engine disintegrated during ascent and while the remaining engines and the second stage were able to make up the shortfall and place Dragon into the expected orbit, an Orbcomm satellite that was also aboard the rocket could not reach its planned orbit and reentered the atmosphere after only a few days in orbit. The Dragon consists of a pressurised cargo module and an unpressurized Trunk section which can carry external cargo to the space station. Following its departure from the station and deorbit burn, the Trunk is separated to burn up in the atmosphere, while the pressurised capsule descends under parachute to be recovered. With the retirement of the Space Shuttle, Dragon is the only spacecraft that allows significant amounts of cargo to be returned to Earth from the outpost – the only other recoverable spacecraft that visits the station is the manned Soyuz. At launch, the spacecraft was loaded with 2,257 kilograms (4,976 pounds) of cargo; of which 1,790 kg (3,946 lb) will be in the pressurised module. This includes 370 kilograms (816 lb) of supplies and provisions for the crew, 280 kg (617 lb) of spare and replacement parts for the space station, one kilogram (2.2 lb) of computer equipment, 127 kg (279.9 lb) of hardware to support EVAs and 54 kilograms (119 lb) of equipment for the Russian segment of the station. Another 930 kilograms (2,050 lb) of cargo capacity is dedicated to scientific research. 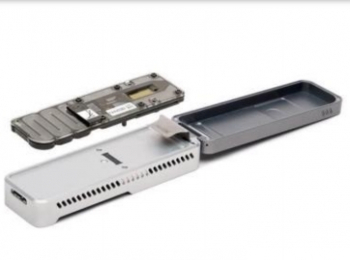 Experiments being delivered include a Biomolecule Sequencer which will attempt to sequence DNA in an attempt to demonstrate whether this is possible in the space environment; a capability which could aid microbe identification on future manned missions and have applications in the search for life elsewhere in the universe. The Heart Cells investigation will explore how the human heart is affected by spaceflight and the microgravity environment. Heart cells were grown from stem cells produced from human skin; astronauts aboard the station will grow these cells for a month and study how they change at a cellular and a molecular level. The OsteOmics experiment is designed to validate the use of magnetic levitation in experiments on Earth to simulate a microgravity environment. It is hoped that this will lead to a better understanding of bone loss in astronauts, in long-term bed-bound patients on Earth and in people suffering from diseases such as osteoporosis. 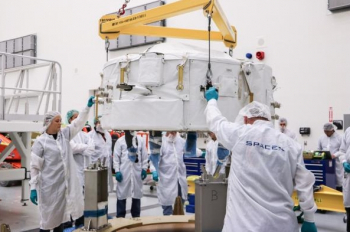 Other payloads aboard the Dragon include the Phase Change Heat Exchanger (PCHX) which will compare wax and water-based heat exchangers, used to help regulate the station’s temperature and protect it from extreme differences in temperature between sunlight and shadow. The Maritime Awareness payload consists of an Automated Identification System (AIS) receiver to relay tracking and distress signals from ships at sea, which will be trialled aboard the space station for a year. Many unmanned satellites already carry AIS receivers. 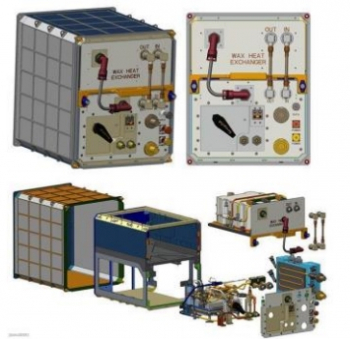 Two commercial NanoRacks payloads will also be delivered; one of these will see four off-the-shelf Gumstix miniaturised computers mounted outside the station to investigate how they are affected by radiation. The second will test three-dimensional solar cells composed of carbon nanotubes and copper-zinc-tin-sulphide surfaces which it is hoped will be more efficient than existing solar cells and be able to generate more power at a greater range of incidence angles. 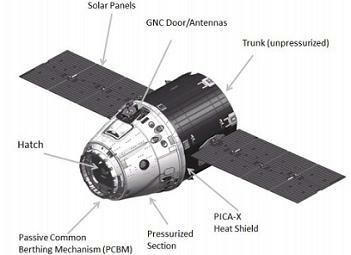 The payload being carried within the Dragon’s unpressurized Trunk section is the 467-kilogram (1,030 lb) International Docking Adapter 2 (IDA-2). The International Docking Adapters are devices designed to convert APAS-95 docking mechanisms – which were used by the Space Shuttle – to the new NASA Docking System (NDS) or Low Impact Docking System (LIDS) standard which is to be used by future US manned vehicles including the Dragon v2, Boeing CST-100 Starliner and Orion. IDA-2 will be affixed to the docking port of Pressurised Mating Adaptor 2 (PMA-2), at the aft end of the Harmony module. Launched alongside – and already berthed to – the Unity module in December 1998, PMA-2 was the main docking port for Space Shuttle missions to the space station; used for thirty-five of the Shuttle’s thirty-seven visits. PMA-2 was originally to have been fitted with IDA-1, while IDA-2 was meant for the backup port on PMA-3. However, following the loss of IDA-1 in last June’s Falcon launch failure, IDA-2 was reassigned to replace it and construction began on a third adaptor to launch in 2017 or 2018. 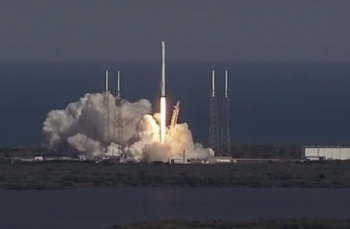 Dragon missions launch atop SpaceX’s Falcon 9 rocket, which made its twenty-seventh flight on Monday. Flying in the “Full Thrust” configuration, sometimes – unofficially – known as the Falcon 9 v1.2, the rocket is a two-stage vehicle with nine Merlin-1D engines powering the first stage and a tenth, adapted for in-vacuum operation, providing second-stage propulsion. SpaceX introduced the Falcon 9 in June 2010 with the successful launch of the Dragon Spacecraft Qualification Unit – a boilerplate mockup of the Dragon spacecraft – with Dragon making its debut six months later on the Falcon 9’s second flight. The Falcon 9 is designed with the ambition of reusability in mind; the first stage is equipped with landing legs and can attempt a powered descent following its separation. Falcon 9 launches to the International Space Station and other low-inclination orbits take place from Space Launch Complex 40 at the Cape Canaveral Air Force Station in Florida; a former Titan launch complex which dates back to the late 1960s. SpaceX rebuilt the complex for the Falcon 9 between 2008 and 2010, demolishing the Titan’s fixed and mobile service towers. Falcon vehicles are integrated horizontally in a hangar near the pad entrance. Falcon 9 is the second rocket developed by SpaceX, following the smaller Falcon 1 which made five launches from Omelek Island, part of Kwajalein Atoll in the Marshall Islands, between 2006 and 2009. Since its introduction, three different versions of the Falcon 9 have been used. The first five vehicles flew according to the original design – using Merlin-1C engines and a square grid engine arrangement on the first stage. 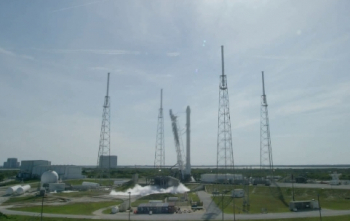 From the sixth launch onwards this was replaced by the Falcon 9 v1.1. The v1.1 configuration stretched both the first and second stages, introduced the Merlin-1D engine and rearranged the first stage engines into an octagonal, or “OctaWeb” pattern. The v1.1 could be flown with, or without, legs depending upon whether the mission would include a landing attempt or if the rocket’s full performance needed to be dedicated to the primary mission. This configuration made fifteen launches – achieving fourteen successes – and three landing attempts all of which reached the landing platform but exploded upon touchdown. The Full Thrust version of the Falcon 9 was introduced in December 2015 and has now fully replaced the v1.1. With a further stretched second stage and denser supercooled liquid oxygen oxidiser, the Full Thrust model increases performance to allow for first stage recovery attempts on geosynchronous launches, which previously required all of the vehicle’s available performance. Monday’s launch was the seventh of the Full Thrust configuration, as much as SpaceX internally do not use the “full thrust” identification. The use of supercooled oxidiser – which is denser because of its lower temperature, allowing more to be carried without increasing tank volume – requires that tanking occur just minutes before liftoff, resulting in a shorter countdown. Thirty-eight minutes before liftoff the Launch Conductor polled controllers for approval to begin fuelling the rocket, with propellant and oxidizer loading beginning three minutes later. The terminal count began ten minutes before liftoff. Seven minutes ahead of the launch chilldown of the first stage engines began and the Dragon spacecraft switched to internal power. A minute later the rocket itself transferred to internal power; shortly afterwards the “Strongback” structure used to transport the rocket to the launch pad, erect it and provide a mast for umbilical and cable connections, was retracted away from the rocket. Arming of the flight termination system (FTS) – explosive charges that serve as a self-destruct mechanism in the event of the rocket going off course – occurred three and a half minutes before launch. Final approval to proceed with the launch was given by the Range Control Officer and Launch Director, 120 and 90 seconds ahead of liftoff respectively. 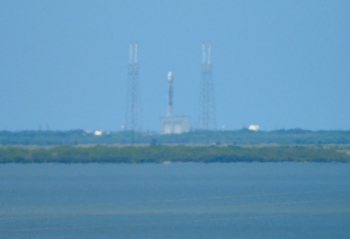 In the final minute of the countdown the rocket’s onboard computer performed a pre-programmed sequence of final checks, the vehicle pressurized its propellant tanks and the launch pad’s “Niagara” water deluge system was activated. Ignition of the nine first stage engines took place three seconds before liftoff, building up to full thrust before the vehicle was released at the zero-second mark in the countdown. 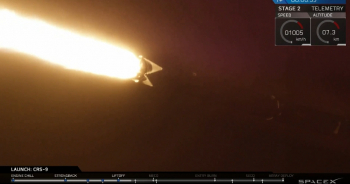 Ascending from Cape Canaveral, the Falcon headed Northeast out over the Atlantic Ocean, passing through the area of maximum dynamic pressure, or Max-Q, 68 seconds into the flight. 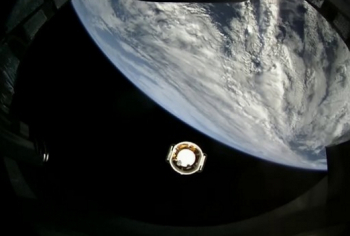 The first stage burned for two minutes and twenty-one seconds before main engine cutoff, or MECO, marked the end of its contribution to the Dragon’s mission. Three seconds after engine shutdown, the first stage separated from the vehicle to begin its journey back to Cape Canaveral for a landing attempt on Landing Zone 1. Eight seconds after staging, the second stage ignited for a six-minute and thirty-second burn that injected Dragon into Low Earth orbit. Spacecraft separation came thirty-five seconds after the end of this burn, at nine minutes, 37 seconds mission elapsed time. 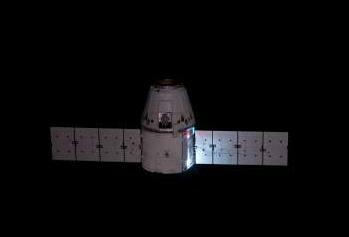 About two minutes after separation Dragon deployed its solar arrays; a little over two hours later it will open its guidance, navigation and control (GNC) bay, exposing its navigation sensors. While second stage flight is in progress, the first stage marked its own series of burns using a subset of its engines; beginning with a boostback manoeuvre eighteen seconds after its separation. This arrested the downrange motion of the vehicle and put it on course for a return to Cape Canaveral. Three minutes and 49 seconds later an entry burn was conducted to slow the stage, reducing heating as it fell back into Earth’s atmosphere. Finally, a little over a minute later, the engines restarted as the stage approached its landing site, making a powered final descent to a soft landing. 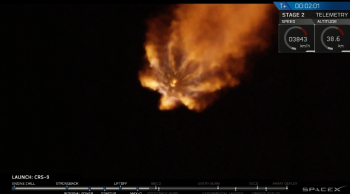 SpaceX continues to characterise the landing attempts as purely experimental and whether they succeed or fail, they have no impact on the overall success of failure of the primary mission. Monday’s launch was the tenth attempt to land the Falcon 9’s first stage; of the nine previous attempts four have succeeded. Most of the previous attempts have been made at sea, using the Autonomous Spaceport Drone Ship (ASDS) barges; Monday’s mission was only the second attempt to reach dry land. 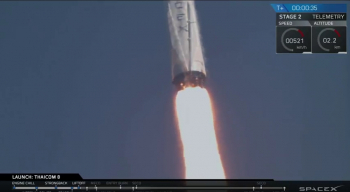 The only previous landing attempt at Cape Canaveral was during last December’s Orbcomm launch, the maiden flight of the Full Thrust Falcon 9 and the first time SpaceX succeeded in recovering the first stage. 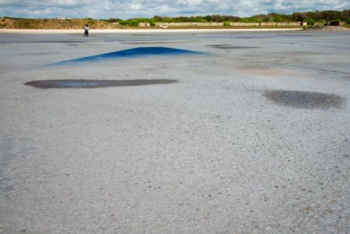 Cape Canaveral’s Landing Zone 1 was built on the site of the former Launch Complex 13. Built for test flights of the Atlas missile, the first launch from the complex – the first successful Atlas-B test – occurred in August 1958. In total, fifty-one launches were made from Launch Complex 13, including thirty Atlas-B, D, E and F missiles and twenty-one orbital launches of Atlas-Agena vehicles. When it supported its final Atlas-Agena launch in April 1978, it was the last of Cape Canaveral’s original four Atlas pads to be deactivated. The complex was abandoned in place, and declared a national historic landmark in the 1980s, however by 2005 the pad’s structures had become unstable through corrosion and neglect; on 6 August 2005 the mobile service tower was demolished by a controlled explosion on the grounds of safety. SpaceX leased Complex 13 from the US Air Force in February 2015 for use as a landing facility. Following launch, Dragon began a two-day pursuit of the International Space Station, ending in its capture by astronaut Jeff Williams aboard the outpost using the CanadArm2 robotic arm. Dragon will be berthed to the nadir port of the Harmony module for around five weeks, before being unberthed and released – again using CanadArm2. At the end of its mission, Dragon will return to Earth for a landing under parachute in the Pacific Ocean off the coast of California. Monday’s launch was the seventh of 2016 for SpaceX and its Falcon 9 rocket; six of these launches have used the Full Thrust configuration, the seventh was the final launch of the Falcon 9 v1.1 in January. Worldwide it was the forty-sixth confirmed launch of the year; excluding an Iranian launch in April which may have been either a suborbital test flight or failed orbital launch of the Simorgh rocket. The Dragon launch comes less than two days after Russia’s successful launch of the Progress MS-03 spacecraft, which is currently en route to the space station and will arrive ahead of Dragon. The next mission to the ISS is currently scheduled for 22 August, with Orbital ATK aiming to return its Antares rocket to flight and deliver a Cygnus spacecraft to the station. 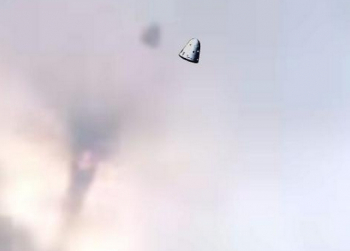 Dragon’s next flight is expected to occur in mid-November. 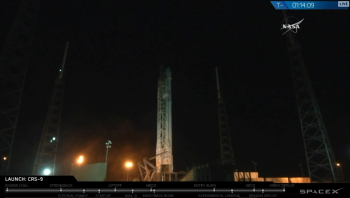 SpaceX is targeting the same date for their next launch, which will see a Falcon 9 orbit Israel’s Amos-6 communications satellite.